Voting for the UK Independence Party (UKIP) is like penning a suicide note, which will “not be forgiven” if it denies Britons the opportunity to vote on the UK’s EU membership, Britain’s Work and Pensions Secretary warned on Tuesday. In a frenetic intervention less than 48 hours before polling day, ex-Tory leader Iain Duncan Smith pleaded with Britain’s electorate not to risk a decades-old campaign to reform Britain’s relationship with Brussels. In an exclusive interview with The Telegraph, Duncan Smith described backing UKIP in the general election as an “unfathomable” act that would pave the way for a weakened minority Labour government to seize control of Number 10 with backing from the SNP. The Work and Pensions Secretary’s remarks come as the Conservative Party ramps up its campaigning in a last ditch effort to win over voters. With Britain’s opinion polls primarily deadlocked, Conservative Prime Minister David Cameron believes personal, impassioned pleas to smaller groups of voters in local constituencies could help realize a majority victory on May 7. A multitude of opinion polls in recent weeks indicate UKIP’s influence is waning in core marginal constituencies across the country. Nevertheless, the eurosceptic party’s vote has not entirely collapsed, as many Conservative analysts had predicted. Senior Conservative strategists remain concerned that a sufficient percentage of the electorate will back UKIP on Thursday to weaken the Conservative vote in certain areas and allow Labour to win key seats. Such a development would be warmly welcomed by UKIP leader Nigel Farage, who launched a nationwide advertising campaign on Tuesday in an effort to halt UKIP supporters from making a last-minute retreat to Conservative ranks. Duncan Smith is one of the Conservative Party’s most prominent eurosceptics, whose former rebellion against ex-Conservative PM John Major over the terms of the EU’s Maastricht Treaty attracted considerable attention. The Work and Pensions Secretary said a further 10 years with Britain’s Conservative Party in power would enable the completion of the party’s economic plan. “If we stay in power for another 10 years, all I would say is with the welfare reforms to complete, with the economic changes that we’re making, I actually am more optimistic about the future for Britain than I have been in 24 years in politics,” he said. Duncan Smith warned, however, that the Tories’ controversial welfare reforms would “hit the buffers” if Labour and the SNP assume power after Thursday. Labour are still “trapped in a time warp” when it comes to benefit reforms, he added. 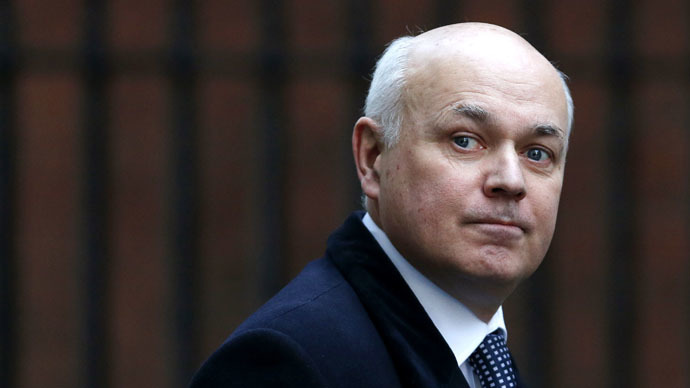 In recent years, human rights campaigners and MPs have sharply criticized austere welfare reforms introduced by Duncan Smith such as the benefits cap and the bedroom tax. Experts warn these policy changes have had a discriminatory and disproportionate impact on society’s most vulnerable, including women attempting to flee abusive partners, ethnic minorities, the disabled, the elderly and children. Having previously played a relatively muted role in Britain’s general election campaign, the Work and Pensions Secretary’s message Tuesday will be understood by many as a sign the Conservatives are fearful of losing power on May 7. “The last thing I always say to UKIP people on the doorstep – and it’s very simple – is that for 24 years I have campaigned for a referendum on the European Union,” he said. Duncan Smith went on to say Britain’s electorate have long wanted a referendum on Britain’s EU membership. He said a failure to vote for the Tories on Thursday amounts to the sacrifice of such a referendum – a development that will not be forgiven. On Tuesday, PM David Cameron will embark on a 36-hour tour of the UK in advance of Thursday’s vote in an effort to increase Tory support in scores of constituencies that could propel his party toward an electoral victory. In a campaign rally, the PM will encourage people voting for UKIP or the Liberal Democrats to back the Tories instead, and avoid the “chaos” a Labour government dependent on “back-room deals, bribes and ransom notes” would reap. Cameron’s tour will pass through dozens of locations in London, the Midlands, the South West, North West, Wales and Scotland. Chancellor of the Exchequer George Osborne will also travel through target constituencies in a bid to woo voters ahead of May 7. Both PM David Cameron and Deputy PM Nick Clegg are heavily focused on how to cling to power in the event the outgoing coalition government forfeits its Commons majority. Polls across the country consistently suggest a hung parliament is likely, with the Conservatives predicted to win slightly more seats than Labour. Analysts argue the Liberal Democrats’ loss of a considerable share of seats will mean another Conservative-Lib Dem coalition will not secure a majority in the Commons. In such a scenario, observers predict Cameron will insist on remaining in Downing Street rather than allow Labour the opportunity to form a government.